Good morning from Southern Utah on the Colorado Plateau! An amazing panel of petroglyphs covering a large boulder that is split in two. I definitely will need to return and photograph this location in better light someday. Here’s a closer look at some of the Glen Canyon Linear Style petroglyphs found on these boulders. A very nice petroglyph of a spiral and a zig-zag line. Beautiful streaks on the wall of a very large alcove. Amazing red Basketmaker pictographs. The figure on the left appears to be holding a dripping bag (perhaps a scalp?) with two atlatls piercing it. Very interesting! A couple of storage cists located at the back of a large alcove. Here’s an interesting and remote kiva that I visited with Alan. This kiva is built into the soft mudstone layer found at the back of a large alcove. The remaining roof and entrance to the kiva. When you take a look inside the kiva, you can see that after they dug out the space in the mudstone, they lined the walls with stones and mortar, except for the sandstone at the back of the alcove that makes up the rear wall of the structure. I like that the upright posts are still in place. Here’s a closer look at the masonry and the posts inside. It’s hard to tell from this photo, but this is a pretty large pictograph panel consisting of some pretty faded white anthropomorphs. 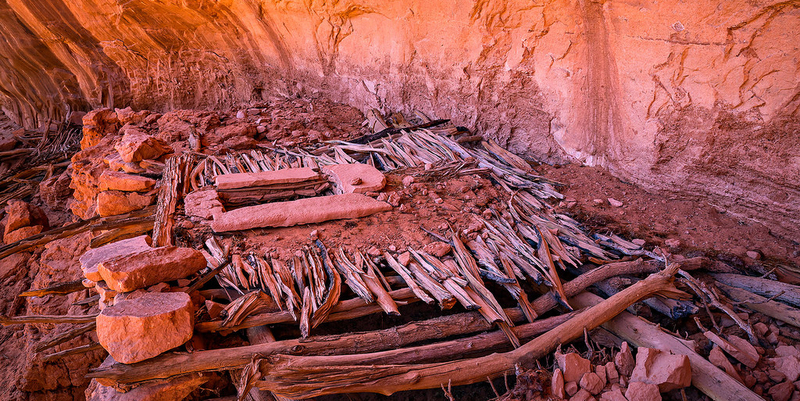 The remains of a collapsed kiva roof. A couple of unusual granaries located at the back of a very deep alcove. A closer look at the granaries, constructed of wood, slabs of sandstone and mortar. This alcove contained a lot of corn cobs, plus the most corn husks I’ve ever seen. Green, red and yellow handprints. I found these colorful handprints on part of a boulder that appears to have fallen from above. A beautiful morning for a hike through a canyon. A pretty nice arch I found while searching for ruins. A couple of petroglyphs located high on a canyon wall. I’m not really quite sure what animal they are supposed to represent? If you have any thoughts, feel free to post them below in the comments! I love seeing the corn cob remains and the cists. Great pics of the kiva, etc. Would that be Alan V.? I have never met him, but he and I do have a mutual friend (Dana) who we have hiked in Cedar Mesa with. Thank you for your amazing photographs. I am headed to Bear’s Ears in a couple of weeks and am going through various websites that have photos of the area. Were some of photos taken in areas where you were just wandering? Some places I found while just wandering, some I followed my friend Alan to. Great job not sharing locations. I know and love many of them. The last happens to be a favorite and caught me by surprise. I have often wondered about the 4 legs; special place for me that I have been a lot despite that sand. I have been to that exposed Kiva too, great area and very deep. Great lesson in visiting but not sharing details.